located on the river LOT and practically in the city center will be your home base. You are a 7-minute walk from the Town Hall (downtown). On its large terrace you can enjoy boating, the VALENTRE Bridge and its illuminations at night but you will also get barbecue parties. You will not be bothered by the noise of vehicles, trains or planes but perhaps by the tumult of the water on the road or the humming of the micro - power station. If you like walking, fishing, archaeological sites, old buildings, basements, underground caves, swimming, boating, sports and cultural activities, small good and great restaurants, all these activities will be at your fingertips . Parking and garage, easy to access at the foot of secure residence. Apartment sunny, bright, well équipé.La kitchen has a large work surface antimicrobial treatment. A large air-conditioned living room opens onto the terrace. Both rooms have views of the Lot. The decoration was neat. The bathroom is bright and pleasant. 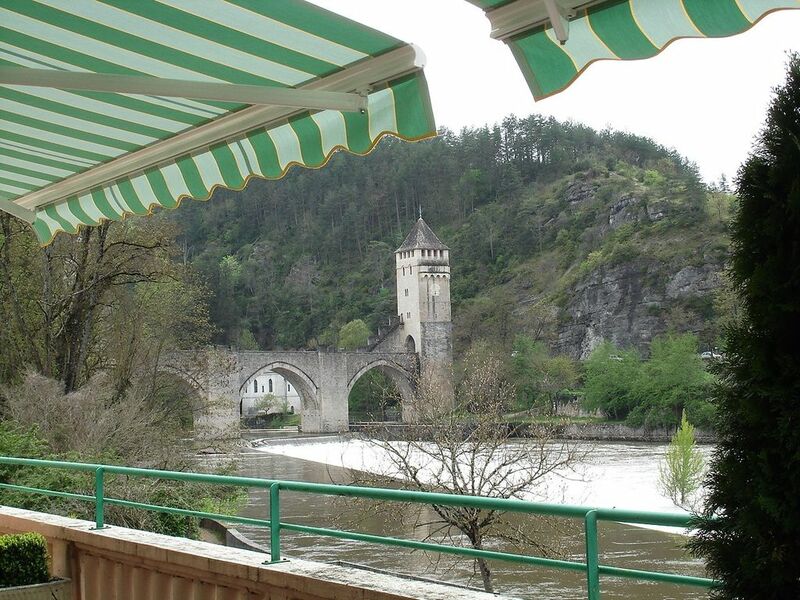 This apartment is located in Cahors, a MIDI-PYRENEES GREAT SITES. It is a city of ART AND HISTORY; , Labeled REMARKABLE GARDEN by the Ministry of Culture and Communication gardens are very neat. Cahors is a crossroads going to Saint-Jacques -from Compostela. BRIDGE VALENTRE and the SAINT ETIENNE Cathedral are registered in the directory UNESCO n 'wait to discover them. - Hot air balloon, boat trip, cruise, little train, carriage. The deposit or security deposit is settled on arrival (refundable), or € 200 cash or check payable to France. The end of stay cleaning is optional: 50 €, but retained automatically if the cleaning is not impeccable. Rental of towels 5 € per person, and house 10 € for the week. Sheets are provided free of charge. A large garden table and 6 chairs in teak, a server and 4 sun, umbrella, a BBQ grill and griddle gas are available on the terrace. Interior living room: 2 leather sofas, one 3 seater and 1 of 2 places. Linens, towels, toiletries and washcloths can be made available for a fee. Terrace of 60 m2 facing west overlooking the LOT and VALENTRE BRIDGE, classified at UNESCO. Nelly and Alain were great hosts and their apartment, on the bank of the river Lot overlooking an amazing 14 century bridge, was beautifully presented and well equipped. We loved sitting on the large balcony enjoying the river scene in the evening. It was very easy to walk into old town Cahors or get away by car (and there is a dedicated garage) to all the wonderful areas of the Lot valley and historic sights. We would highly recommend to others and definitely return to this lovely apartment in a very quiet area - we had a superb week. Thank you! This a spacious and very well equipped apartment within 10-15 mins walking distance of the centre of Cahors, and the Pont Valentré practically on the doorstep. Our visit was in November, so we didn't manage to use the spacious balcony with barbecue - but that would be superb in summer. The apartment has an excellent kitchen with more equipment than most people will need - and don't miss Les Halles for shopping, we even managed to buy fresh real Perigord truffles! Nelly & Alain made us very welcome and couldn't do enough to ensure that we enjoyed our stay. If you need a 2 bed apartment in Cahors then this one can be highly recommended and we'll stay here again if we return to Cahors. We stayed here for 25 days and loved every one of them. The apartment is very clean, spacious and comfortable, equipped with everything one could possibly need and situated in a quiet area by the River Lot. The large terrace provides the perfect spot to sit and watch life on the river. The owners, Nelly and Alaine are justifiably proud of their apartment and went out of their way to make our stay as pleasant as possible. We will be ever grateful for the help they gave us in retrieving our lost luggage from Air France. Cahors provides an excellent base for exploring the region and the town itself is full of interest, both historic and modern. The twice weekly market is a treat and there are numerous excellent restaurants. We have no hestition in giving this apartment the highest recommendation. Nous sommes restés ici pour 25 jours. L'appartement est très propre, comfortable et bien équipé, dans un endroit calme à côté de la rivière. Il y a une grande terrasse, parfaite pour regarder la vie sur la rivière. Les propriétaires, Nelly et Alaine sont très gentil et utile. Cahors est une ville très intéressante avec un excellent marché deux fois par semaine. Nous n'hésitons pas à recommander cet excellent appartement. Directly across the street, on the river, is a small water treatment plant. It always makes a noise, and that's probably the "gentle hum" the landlord mentions in her description. But what she doesn't mention is that often the noise turns into a loud, whoosing sound that caused us to flee indoors and shut the windows. Back home at our local airport we have to walk out on the tarmac to get to an airplane, and sometimes a plane's jet engines will be idling. It's a fairly loud sound and it's a relief when you can get off the tarmac. And that's what the sound was like from the water treatment plant. Like a jet engine waiting to take off. To be fair, the jet engine noise varied during the day from the jet sound to that gentle hum. But its presence prevented us from fully enjoying the large deck. We tried having Sunday lunch on the patio but gave up after the noise got to be too much. It's also unfortunate that the view of the pretty Lot River is obstructed by the same water plant. To see the river and the Valentre bridge, you have to crane your neck to the left. We also deduct points for the very laborious check-in and check-out process. It was a lesson in old-fashioned, French bureaucracy. It took about 45 minutes to cover every tiny detail about the apartment, including how to put down the toilet seat, how to open windows, how to open the fridge, etc. Most of the instructions involved NO and DON'T. As in, don't put anything hot on the counter, don't move this corkscrew from this drawer, don't slam the toilet seat down, don't put the blinds up too far. There were extra charges to rent bath and kitchen linens (the VRBO listing does say that lines are extra, but still). We had to pay 25 Euros "rent" on towels that were like drying yourself with tissues, they were so thin. These cheap linens could have been purchased for a few Euros. Extra points deduction for the long, laborious check-out process where every single thing was counted, every appliance was checked and, of course, there were more forms to be filled out and signed off before we could get our deposit returned. Bottom line: will we return to the apartment? No. Quand on veut s' amuser ou bien se faire plaisir en critiquant tout et n' importe quoi dans l' excès c' est très facile mais il faut avant tout être soi-même irréprochable. la caution, j' ai été trop gentille. Je me permets de vous saluer maintenant ( cela se fait en France ), ce que je n' ai pas pu faire lors de votre départ, car vous avez brillé par votre absence lors de l' état des lieux de sortie (durée: moins de cinq minutes) je le regrette, c' est la moindre des politesses cela nous aurait permis de nous expliquer de vives voix et face à face et cela aurait été plus courageux. Effectivement, il y a eu un incident de fonctionnement sur un des deux ventilateurs censés refroidir les moteurs électrique de la micro centrale, signalé le samedi de votre arrivée et résolu dès le lundi matin, suite à mon intervention auprès du responsable. Je n' y suis vraiment pour rien et c' est exceptionnel. De plus, quand on n' a pas les moyens de se faire plaisir avec une option à cinq euros par personne ,on fait en sorte de s' en passer en faisant le nécessaire avant son départ. Si les draps de bain, serviettes et gants en nids d' abeille (linge acheté chez un professionnel du linge de maison) ne vous convenait pas pourquoi n' avoir rien dit et pourquoi en avoir demandé davantage , j' en avais d' autres en éponge à vous proposer. J' espère toutefois que ce séjour en France a permis à l' adolescent qui vous accompagnait d' apprendre quelques mots de base de la langue française comme « bonjour, au revoir, oui merci, non merci... », on ne le saura jamais. From the warmest of welcomes from our hosts we could not have wished for more from our stay in this lovely apartment. The owners really had thought of everything and it was obvious from their welcome that they wanted us to enjoy our stay. The apartment is spacious and furnished to a very high standard. We encountered a real heatwave during our stay so the air conditioning was an essential luxury. Eating out on the balcony in the evening and watching the Pont Valentre was truly unforgettable. The town centre is just a 10 minute or so walk away and there is a lovely footpath right from the door around the riverside to the historic quarter of Cahors. There are a few basic shops within walking distance but the supermarket was an easy 10 minute drive away for big shops. Third time is the best, yet! We love this city, the apartment and Nelly and Alain for their grand hospitality. This was our third stay in 3 years. We couldn't stay away, dreaming of the rillette d'oie, melon Quercy and the beautiful river Lot that flowed by in front of our gorgeous, huge terrace. Cahors is fascinating and loaded with great restaurants, city markets and beautiful historical experiences. Madame and Monsieur Serra are superb hosts and the apartment provides you everything you need with the best equipped kitchen in all our travels. Walking (footpaths), near the Pont Valentré (pedestrian access only). Le dépôt de garantie ou caution vous sera demandé à votre arrivée ainsi que le solde de la location , y compris les options( linge de toilette , de table ou le ménage )si elles sont prévues lors de la réservation. La taxe de séjour obligatoire ne vous sera pas demandé mais merci de nous préciser lors de la réservation l' âge des enfants pour son calcul.